The City Institute is able to accommodate a limited number of visiting scholars each year. The Institute encourages applications from faculty members, graduate students and post-doctoral fellows from other institutions. Normally, we can provide visitors with a shared workspace, Internet access, and a York University library card. There is no monetary funding available for visiting scholar appointments. Applications will be accepted at the start of each academic semester (September 1, January 1 and May 1). Visitors should apply a minimum of one semester ahead of when they plan to arrive at CITY. If you are interested in applying to becoming a Visiting Scholar with the City Institute, please complete and send the application form, the letter of reference and a current copy of your curriculum vitae to city@yorku.ca. Thank you. Between 2016 and 2019 Kevin Ward is a Visiting Professor at The City Institute at York University, Toronto. This position involves three two week visits for Kevin and the first of these took place in October 2017. The focus of the award is for Kevin to build and enhance relations between the urban research done at Manchester and at York, as well as between York and its near neighbours, Ryerson University, the University of Toronto and the University of Waterloo. During his visit to York he gave two academic seminars (including one at the University of Waterloo) and four graduate seminars, met with a couple of Ph.D. students, had meetings with four early career researchers and gave a short presentation as part of the final conference of the MCRI Global Suburbanisms research project (http://suburbs.info.yorku.ca/). Vahid Kamal Alavi is an International Visiting Researcher at the Faculty of Education and a Graduate Affiliate with City Institute at York University from January 2019. Vahid is a PhD Candidate in Learning Cities Development at the Faculty of Education, UTM, Malaysia. With a background in GIS and Urban Management as well as diverse working experience in promoting Non-formal Learning, his research interests include: 21st Century Education (Skills and Teaching Methods), Community-University Relations, Community Engaged Learning, Non-formal & Informal Learning, and Learning Cities Development. His PhD focuses mainly on the planning and implementation phases of learning events in urban areas. Vahid is a permanent member of the Iran's National Elites Foundation as well as a former researcher of Tehran Urban Research Planning Center, a research institute in Tehran, Iran. He worked as the Head of Department and Director International Affairs of DMIT Private University in Tehran in providing on-the-job training courses for Iran Mall. Vahid Kamal Alavi is also the Director of International Services at Movafaghiat (Success) Magazine that promotes non-formal learning for its Persian speaking audience in Iran and worldwide. Dr. Constance Carr, an MES Alum, received her doctorate from the Humboldt University in Berlin, and is currently a Senior Postdoctoral Researcher at the Institute of Geography and Spatial Planning, University of Luxembourg. Much of her post-doctoral work has focussed on policy and planning practices in urban regions under growth pressure, looking at emerging sub- or post-suburban and cross-border urban regions, governance structures of small states, and critical takes on European sustainable urban development. While at CITY, Carr looks forward to giving seminars on these issues, and strengthening international networks of urban studies scholars. At CITY, Carr will also be pursuing a project entitled, "Digital Urbanism and the Challenge of Urban Governance (DIG_URBGOV)." The aim of this project is to understand the broad question of how technology is unfolding in societal contexts and what the related impacts or implications are. As new modes of accumulation are invented, and as we are witnessing a revolution in digital devices/services/economies, some urgent questions are surfacing: What is the role of big tech in urban development? What kinds of societal impacts might we expect? How are these impacts and interrelations negotiated, and how are they governed? Inspired by scholarly and qualitative takes on the digital turn in urban geography, corporatization of urban governance and land use, policy mobility, and sustainability, Carr will be researching Alphabet Inc.'s involvement in urban development along Toronto's lakeshore, which is a potential minefield of lessons. DIG_URBGOV thus aims to bridge two tech-driven economic development on the one hand, and urban policy and spatial planning on the other. Project details and updates can be found at Urbanization Unbound (urbanunbound.blogspot.com). Mojgan Chapariha is a Visiting Scholar at the City Institute from June 2017 to May 2018. She is a PhD student in the department of Development Studies at the Lisbon School of Economics and Management (ISEG), University of Lisbon, Portugal. She is interested in SDGs and human well-being. Her PhD thesis with explore a comparative case study of Toronto, Canada and Isfahan, Iran. Nehal El-Hadi is a Visiting Scholar at CITY from September 2017. Nehal is defending her dissertation in the Department of Planning at the University of Toronto in early fall 2017. Her dissertation is entitled, “The Production of Presence: How Women of Colour Tansmute Online Activities into Offline Change.” Her research interests lie in the intersections of – and interactions between – the body, space, and technology. Her work investigates the relationship between online and offline lives and spaces, rejecting the idea that online and offline are separate worlds. More specifically, she researched how women of colour social justice activists living in Toronto accessed their right to the city through their online activities. In addition, Nehal has started to extend her research into the health care experiences of racialized women. Tania Hernandez-Cervantes is a Visiting Scholar at CITY from September 2017. Tania received her PhD from the Faculty of Environmental Studies at York University. Her dissertation investigated the food linkages between Mexico City and a nearby agricultural region, Milpa Alta, through a commodity supply chain analysis of nopal, a native food, from the 1990s to the present. This project contributed to the analysis of complex rural-urban relationships framed in neoliberal capitalism and in a context of intense interaction of peasants with globalized city dynamics. While at CITY, Tania will develop a research plan that includes city-food region models and approaches to urban food systems’ adaptation to climate change, that address economic and culturally appropriate access to food for low income communities of main cities of both the global south and north. Azam is a Visiting Scholar at the City Institute and an Instructor at the Faculty of Liberal Arts and Professional Studies, York University. She has worked as a professional development and urban planner with different national and international organizations before she started her doctoral program in 2008. Her Ph.D. research focuses on the convergence of developmentalism, worlding practices, and neoliberalism in the urban reforms in Tehran. Her research interests include modernization, developmentalism and production of space, urban and regional governance, social housing, gender and space, and research methods. She has edited the books: The City and Deadly Earthquakes: An Interdisciplinary Approach to the Causes of Vulnerabilities of the Urban to Earthquake (2010, Tehran: Agah) and A Critical Lens on Women’s Empowerment and Development Discourses (2009, Tehran: Agah Publishing House). Her recent articles include: “Towards a differential planetary urbanization: A view from Middle Eastern cities” (co-authored with Oded Haas 2018), Environment and Planning D: Society and Space; “The space reloaded: publics and politics on Enqelab Street” in Sharp and Panetta (eds.) Beyond the Square: Urbanism and the Arab Uprisings (2016); “Decentralization and ambiguities of local politics in Tehran” (co-authored with Arang Keshavarzian 2016); “La rénovation urbaine en Iran: De I’interventionnisme d’Etat au mercantilisme” in Mina Saeidi-Sharouz (ed.) Le Téhéran des quartiers popularizes, transformation urbaine et société civile en République Islamique (2013). Dr. Negin Minaei is a visiting scholar at the City Institute from February 2019. She is a research associate at the Faculty of Engineering at the University of Windsor working on the impacts of technological advancements on future cities. She recently wrote a chapter on ‘Self-sustaining Urbanization and Self-sufficient Cities’. She developed a course titled ‘Sustainable Smart Cities’ in 2016 and has taught that to MEng students at the University of Windsor since then. She completed a three-year post-doctoral research on ‘Sustainable Urbanism and Transportation’ at the Royal Agricultural University in UK. As a research associate, she worked on multiple national and regional projects on sustainable development. She earned a MSc in Environmental Psychology from the University of Surrey, UK (2012) investigated the ‘Reflections of Ethnic Backgrounds, GPS and Transportation Mode on Cognitive Maps of Londoners. Negin holds a PhD in Urbanism from Tehran Azad University, Science and Research Branch (2005) studied ‘The Effect of Globalization (Information Technology and Telecommunication) on Physical and Conceptual Aspects of Global Cities (Case Study of London, UK). She received a full scholarship and completed the ‘Transnationalism and Transnational Spaces’ research program at the Bauhaus Dessau in Germany (2004-2005). Her dissertation for her MArch in Architectural Engineering from Kerman Azad University (2000) was in ‘Designing an Echo-Tech Research Centre of Science and Technology of Alternative Energies including a power plant of wind towers and solar cells.’. She aims to write a book on Sustainable Smart Cities while at the CITY as she has been researching smart cities for the past four years. Her current interests are smart cities, self-sufficient cities, healthy cities and future cities. Judith Mintz, PhD joined York University’s City Institute as a Post Doctoral Visiting Scholar in March 2019 and is an instructor for York University’s Bridging for Women Program. Her dissertation is titled, “What is Critical Yoga Studies? : Gender, Health and Cross-Cultural Consumption of Yoga in Contemporary North America.” Judith’s research articulates political economy, critical race theory, and feminist embodiment theories to produce an analysis of yoga and complimentary wellness culture in urban North America. Judith has published her work with the Global Labour Research Centre, Demeter Press, Athabasca Press, Canadian Woman Studies, and Pivot: A Journal of Interdisciplinary Studies and Thought. She also has presented her research on yoga, health justice, and masculinities at the Accessible Yoga Conference, and the International Conference on Canadian Studies in Paris (June 2017). Judith has delivered papers at the Global Labour Research Centre, the Roxana Ng Brown Bag Lectures, and at various conferences for MIRCI (Motherhood Initiative for Research and Community Involvement). Judith’s research plans for her engagement at City Institute involve addressing gender, race, and unequal access to health and wellness infrastructures in urban spaces. Continually examining the connections between consumption and social thought, Judith also conducts commercial ethnographic research as a freelancer. Dr. Jessica Parish is a visiting scholar at the City Institute from September 2018 . She earned her PhD in Political Science at York University in 2017 studying non-residential dimensions of gentrification. Her dissertation examined the impact of the governmental "responsibilization" of health on gentrification processes, and demonstrated how newly privatized spaces and practices of health have become integral to gentrification dynamics in the 21st century. Dr. Parish is currently employed by Lancaster House Publishing, a labour and employment law resource provider in Toronto, where she works as a research associate. She is also associate co-editor for "The Geographies of Emotional and Care Labour" an open access collection published by Palgrave Communications. Her research interests are interdisciplinary in nature and include urban geography, feminist political economy, political theory, the sociology of health and illness and labour studies. Dr. Frederick's research pursues the political economy and political ecology of urban infrastructure building and maintenance in the 21st century. He holds PhD in Political Science from York University, having successfully defended the thesis “Schmutz in the Baltic: Urban Water Infrastructure, Global Finance, Environmental Outcomes in Post Communist Europe”. He has also turned his attentions from the EU and public-private partnerships to Canadian examples and has become more focused on campaigns around urban politics in Toronto to look at multinational business investment and municipal politics. Dr. Mahmud Rezaei received his PhD in Urban Planning and Design from Tehran Azad University in Iran. His research interests include History, Theories, Methods, and Processes of Design and Planning; Urban Morphology and City Forms; and Cities in the 21st Century. While at CITY, Mahmud will explore and categorize public urban design and architectural projects built in Toronto. Heather Sanguins is a Visiting Scholar at the City Institute from February 2019 to January 2020. With a professional background in technical and business communication and project management, she recently completed a doctoral program in historical geography. During Heather's doctoral research, she developed six case studies of Anishinaabe dispossession in the eastern Great Lakes basin during the nineteenth century. Heather will write a book manuscript and a number of articles while at CITY. Lorenzo De Vidovich is a Visiting scholar at City Institute from January to March 2018. He is PhD Candidate at the Department of Architecture and Urban Studies at the Polytechnic University of Milan, with a previous background in sociology. He is interested in human well-being, welfare provision, social and urban policies. His dissertation explores the local welfare planning in three specific Italian suburban areas, dealing with the processes of suburban governance, as framed by the Major Collaborative Research Initiative “Global Suburbanisms”. His thesis focuses on the current socio-spatial polarization which takes place in suburbs. He is a member of “Sui Generis”, a research lab on sociology and public action. He has been a Teaching Assistant both at University of Milan-Bicocca and at the Polytechnic University of Milan. While at CITY, he will be working on the methodological settings of his dissertation, as well as studying Canadian suburbanization as a process halfway through the American and European traditions. Dr. Shekofeh Farahmand is an associate professor in the department of Economics at the University of Isfahan. Her research is in urban economics, and much of her research focusses on urban growth and development (urban development in Iran) and urban primacy. She is currently working on the application of Agent-Based Modeling and Simulation (ABMS) for urban economics modeling. ABMS has been used in various urban subjects including urban environment modeling, urban transportation, housing and pollution, and dynamic urban development modeling as well. Dr. Majid Sameti is an associate professor in the department of Economics at the University of Isfahan. He received his Ph.D. in Public Sector Economics at Nice University in France. He is currently researching how to finance municipal infrastructure projects, and how local governments must allocate financial resources. His research focus includes Private-Public Partnership (PPP) for financing urban projects. Marie is a Masters student from the University of Lyon in France. Marie studies Urban Planning and Politic Sciences, and is interested in the relationship between people and their city. This summer (May - August 2018) Marie is currently working with Professor Alison Bain (Associate Professor from the Department of Geography at York University), on her SSHRC grant Queering Canadian Suburbs. Sabrien Amrov is pursuing her Ph.D. in Human Geography at the University of Toronto. Her work examines the place-making of Arab refugees in Little Syria of Istanbul post-Arab Spring. She is interested in studying how the Arab refugees in Little Syria create intimate solidarity connections in places that are both near (geographically and culturally) and far (by virtue of different political histories and identities) from their homes. The multitude of encounters -- bodily and territorial inclusion, exclusion -- taking place in cities reveal in unremarkable yet intimate ways how different scales of collective and individuals political subjectivities are produced. In 2013, she earned her master’s degree in International Relations, with Honours from the University of Ottawa. Her MA thesis on the Security Sector Reform in the West Bank was funded by the Social Sciences and Humanities Research Council of Canada. In 2011, she earned her Honours Bachelors in Conflict Studies and Human Rights with a Minor in Arabic Language and Culture from the same university. Her work has appeared in the New York Times, Middle East Monitor, Rabble and TRT World. Eiman Ahmed Elwidaa, is a Visiting Scholar at City Institute currently residing in Canada. She is a professional practicing architect in two countries of the Global South and a PhD researcher at Swedish University of Agricultural Science SLU, Uppsala, Sweden. She has Graduate Diploma’s on ‘Neighbourhood Development Planning’ from Institute of Housing and Urban Management Studies (IHS) Rotterdam – Netherlands. She has a Graduate Diploma on ‘Rural Development and Project Planning’ from the Institute of Social Science, The Hague - Netherlands. Eiman has a good experience in teaching architecture and supervising undergraduate research parallel to her on-going research. Her research interests are on the - intersection and interdisciplinary - of Gender, Architecture and Human Settlements in the Global South with special focus on Low-income and Affordable Housing. Eiman has published articles on her areas of interest with the most recent published in 2017 at “Open House International Journal” on “Women and Low-income Housing Transformations in Uganda”. Her research acknowledges and discusses the important but, un-noticed, role women play in shaping the built environment at the cities of the Global South. Eiman advocates for women’s inclusion and mainstreaming gender in the discourses of housing, urbanization and human settlement in general. Hulya Arik is an adjunct faculty at the Women and Gender Studies Department at Trent University. She received her Ph.D. in Human Geography at York University in 2015 with research focus on the Turkish military and the intersections of the secularist discourses with security in relation to the rise of political Islam in Turkey. Her most recent publication “Security, secularism and gender: the Turkish military's security discourse in relation to political Islam” came out at Gender, Place and Culture in 2016. Arik’s current research focuses the cultural aspects of political Islam in Turkey and discussions around secularity, religious plurality and feminism through Islamic visual arts. Dr. Nazgol Bagheri was CITY Visiting Scholar for June 2017. Dr. Bagheri was born and grew up in Tehran. She started to enjoy the complexity of urban landscapes in high school when she observed the city while riding the bus. She received a Bachelor of Architecture in September 2004, a Bachelor of Computer Science in September 2006, and a Master of Urban Design in November 2007 from the National University of Iran (Shahid Beheshti). She worked as an architect for urban projects at an international design firm between 2004 and 2007. She earned her Interdisciplinary Ph.D. in Geography and Sociology from University of Missouri-Kansas City in 2013. Dr. Bagheri is interested in navigating disciplinary terrain in Geography, Urban Planning, and Social Anthropology to develop a working theoretical model to account for changes in the use and design of public space and the unique relationship between the aesthetics of modern planning, the gendering of spatial boundaries, and the contingent nature of public space in Middle Eastern contexts. Dr. Melanie Fasche is a Visiting Scholar at the City Institute for August and September 2017. Her home institution is the Economic Geography Group, University of Bayreuth, Germany. Melanie’s work focuses on value creation in our contemporary economies. During her time at CITY, she will be working on a paper entitled “Practices of Art Market Making in Toronto”. Dr. Nayrouz Hatoum is a Visiting Scholar at CITY from June 1, 2017 to July 1, 2018. Shecompleted her doctorate in the department of Anthropology at York University. Her PhD research centered on the visual and political transformations of the landscape in Palestine after the Israeli construction of the Separation Wall. Her current work explores the social, political, and visual transformations of Kufr Aqab, a neighbourhood at the margins Jerusalem’s municipality, that was cut off from the city’s limits when a section of the wall was built in 2003. Currently, Nayrouz is a lecturer at Ryerson University. Dr. Andre Ortega is a Visiting Scholar at the City Institute from August 2017 to May 2018. He received his PhD from the University of Washington, teaches at the University of the Philippines, and is an Urban Studies Foundation Post Doctoral Research Fellow. His research interests include urbanization in the Global South, particularly postcolonial suburbanisms. While at CITY, Andre will explore “necroburbs”, transnational suburbanisms, as well as the role of suburbs as spaces of neo-imperialism, and sites of resistance. Prof.Akhavan Azari received his bachelor degree in Community Planning /1979 and Master of Urban Planning & Design from Tehran University Faculty of Architecture and Fine Arts/1985, while working with well known Iranian Consulting Engineers and Municipality of Tehran for five years/1980-1985 .He started his Ph.D. studies in Middle East Technical University Faculty of Architecture and Planning Ankara-Turkey in Fall 1985.He submitted his Ph.D. dissertation both in METU and University of Tehran because he was invited to do so by his mother university – University of Tehran/1991-1992. During his Ph.D. studies he was in University of Minnesota-USA department of Housing as visiting Ph.D. fellow / Winter-Spring 1988. As a professional he established PARS ARG Consulting in Architecture/1993 and as an academician He was senior lecturer and full time academic staff in Iran University of Science and Technology / Faculty of Architecture and Planning Tehran-Iran and Islamic Azad University School of Architecture Tehran-Iran /1993 -2013. During the time He established an architectural College named” Pardis Mimar College of Architecture and Design” Tehran-Iran /2002 and was appointed as the first dean of the college . He was the founder of Canadian Mid-East Academy (CMA) in Tehran –Iran as an academic advisory institution / 2004 . The institution was in duty of intensive training of foundation courses /pre- program of Architectural Sciences in Bachelor, Master and Doctorate levels of Canadian Universities according to Canadian curriculum of the programs. Faye holds a PhD in English from York University, specializing in modern and contemporary American literature with an intersectional focus on queer literature and critical theories of sexuality, gender, race, and class. Faye’s current research considers how histories of counterpublic experience are represented in American and transnational queer fiction and memoir written over the last fifty years since Stonewall. As a Visiting Scholar at the City Institute, Faye’s project, Urban Transformations and Queer Counterpublic Histories, looks specifically at queer literary texts that are situated in urban areas where changes in physical and cultural geographies have altered queer spaces. Her research analyzes literary representations of the impact of these alterations on queer counterpublic life and on the material and cultural traces of queer counterpublic histories. Her project also examines how literary modes of remembrance resist and challenge the erasure of material and cultural traces of counterpublic queer histories in urban spaces. Thanh is a graduate of Goethe-University, Frankfurt with a Bachelor of Arts in Sociology as well as a minor in Cultural Anthropology and European Ethnology. She is currently enrolled in the master program “Geographies of Globalization – Markets and Metropolises” focusing on Economic Geography. In her studies she acquired an understanding of the social and cultural impact on individuals and societies during the 20th and 21st century focussing on the advance of technologies, cultural heterogenization, urbanization and increasing migrant movements. Her current research focusses on debates concerning the north-south divide and Political Geography regarding the relation between state politics and civil society in terms of social equity. Gesa Trojan is a DFG doctoral fellow at the International Graduate Program “The World in the City. Berlin – New York – Toronto” at the Center for Metropolitan Studies (CMS) at Technische Universität Berlin (TUB). By exploring Jewish immigrant foodways in Toronto at the beginning of the 20th century, she investigates the interlinkages of memory, migration and food in the urban landscape from a historical perspective. Gesa graduated in Cultural Studies with a focus on social and cultural history at the Leuphana Universität Lüneburg and studied at the Université Paris Ouest Nanterre La Défense. Before she became a culinary interested scholar, her academic work focused on Oral History, Concentration Camps, Collective Memory and Memorial Culture of National Socialism in Germany. She is also a devoted teacher and guide in various historical institutions, such as the Topography of Terror Documentation Center and the House of the Wannsee Conference Memorial in Berlin as well as the historical education project “Geschichtomat” at the Institute for the History of the German Jews (IGdJ) in Hamburg. As a Postdoctoral Researcher (2011-13) at the Department of Geosciences and Geography of University of Helsinki,he was affiliated with FES at York University, and funded by the Academy of Finland. Galanakis was one the members and instigators of the project OURcity for the World Design Capital Helsinki 2012. His Doctor of Arts degree for the University of Art and Design, Helsinki (FI) culminated with the publication of his book Space Unjust (Gummerus 2008) that deals with socio-spatial discrimination against certain transnational people in urban public space. In his Master of Arts thesis "Sustainable Public Space – 21st Century Agoras," for the Design Academy Eindhoven (NL) Galanakis dealt with the system of public space, people and things from the perspective of environmental sustainability. Dr Donia Zhang is an associate at the City Institute, York University. She is a graduate of Oxford Brookes University (BArch, MA, PhD) in the UK and Brock University (MEd) in Canada. Her area of expertise is in courtyard housing development in China and North America, China’s heritage preservation policies and practices, cultural sustainability, and architectural multiculturalism. Donia has 7 years of work experience in the architectural industry in Toronto and Chicago, and 10 years of teaching experience throughout Ontario colleges. The subjects she has taught include: History of Art and Architecture, Interior Design, and AutoCAD. Donia research focuses on the philosophy of architecture and the philosophy of sustainability encompassing both Eastern and Western historic and contemporary approaches. Marcela is an urban anthropologist, associate fellow at the DFG International Graduate Research Program Berlin-New York- Toronto at the Technische Universität Berlin. She holds a Master in historical urban studies with a focus on environmental history from the Center for Metropolitan Studies TU Berlin. She is interested in the sustainable development of cities an regards the cultural behavior, the discourses of the local inhabitants and their knowledge as inputs for city planning and resource management. The relation between culture and nature, between human beings and their environment have a central position in her research work. Marcela has been involved with anthropological and ethnographic research for the Columbia Coffee Growers Association, National University of Columbia's "Group 15", and with the Anthropology department of the National University of Columbia in Bogotá. MA Candidate, Department of Human Geography, Goethe-University, Frankfurt am Main. Markus is mostly interested in questions of sustainable transportation and city development. His bachelor thesis explored Berlin’s way to become a city adapted for cyclists. In Frankfurt he attended seminars on sustainable transport and mobility management, which were mainly focused on European cities. In Toronto he learned about ways to improve sustainable means of transport in car-dependent North American cities with sprawling suburbs. Center for Metropolitan Studies, TU Berlin. Laura Calbet is a PhD-Student at the Center for Metropolitan Studies in Berlin and Assistant Professor & Researcher in the Department for Urban Design & Development at Technische Universität Berlin. In her research she explores the financialisation of housing, specifically the changing patterns in the production and consumption of inner-city real estate, as well as the conceptualization of housing as means of reproduction. Further research interests are urban redevelopment in Barcelona and Berlin, public space in planning politics, and the critical teaching of urban design. She is member of the editorial board of the urban journal suburban. PhD Candidate, Center for Metropolitan Studies, TU Berlin. Sabine is a fellow and PhD candidate in the International Graduate Research Program Berlin – New York – Toronto at the Center for Metropolitan Studies at TU Berlin. She studied sociology and political science at Dresden University of Technology and The New School for Social Research in New York. In her MA thesis on post-Socialist urban development in Dresden she investigated the transition process from modern to post-modern modes in the production of inner-city spaces. Her research interests range from urban sociology, urban environmental governance and political ecology to critical and Marxist geography and critical IPE. Currently, she is working on her dissertation project and conducts research on international city organizations and their role as networks for knowledge and policy transfer in global environmental governance and their influence on the production of urban political ecologies. Prof. Li Wei is a historian and his research and teaching related to Canadian studies has included history of Sino-Canadian relations, historical evolution of Canadian federalism and labour movement. His current interest is in Canadian urban development, especially focusing on the history of Canadian government housing policy and programs and the policy-making process. Prof. Li Wei was at CITY from March to July, 2012. Wolfgang Andexlinger is an Assistant-Professor at the Institute for Urban Planning and Spatial Design at the University of Innsbruck, Austria. His main research focus is based on areas where urban systems collide with rural elements. He wrote his doctoral thesis about the superimposition of rural and urban elements and its spatial impact in tourist alpine regions in Austria. His research focused on action and planning strategies for those ‘rurbanised’ areas, comparing large urban areas such as Toronto with the tourist focused areas in the Alps. The aim is to identify comparable and non-comparable elements to develop strategies for a sustainable and liveable future. Miriam has a PhD in Social Sciences from the Universidad Iberoamericana, Campus Santa Fe, Mexico City. Her research looks at governance, environmental risk, environmental movements and democracy in North America. She is a Research Professor in the Department of Social Sciences, UAM-Cuajimalpa and is a "National Research" Level II within the National System of Researchers in Mexico. She is a member of the Mexican Association of Canadian Studies, and is on the editorial board for the Journal of Canadian Studies, and El Cotidiano Journal. Bernd's research interests include urban and political geography and critical criminology. His main fields of research in recent years have been urban policing, crime mapping, basic notions of historical-geographical materialism, and the recent history of radical and critical geography in Germany. 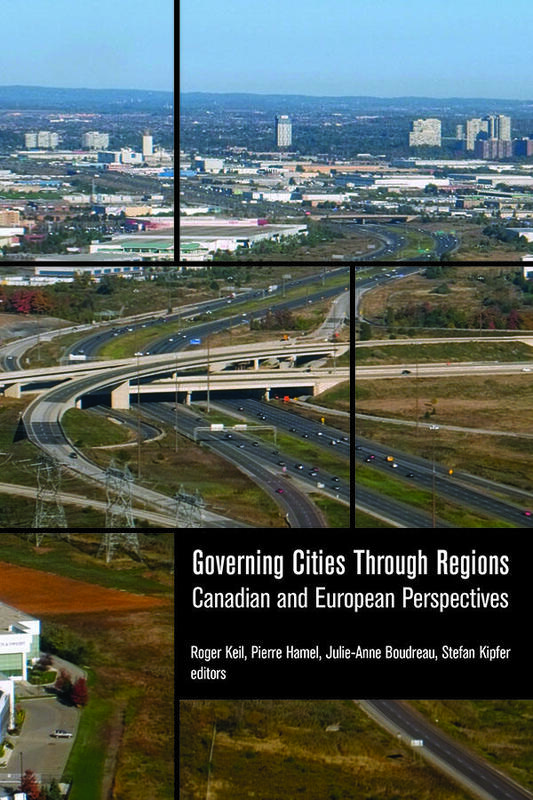 During his stay at York he conducted research on the way in which policing is organized in different municipalities in the Toronto region as part of a larger project that looks into the complicated relationships between core city and more peripheral parts of the global city regions of Frankfurt and Toronto. Denise is a PhD student in History and Fundamentals of Architecture and Urbanism at the Faculty of Architecture and Urbanism from University of São Paulo. She holds a Bachelor’s degree in Architecture and Urbanism and a Masters in History. Her master thesis was about railroad heritage preservation, focusing on the relations between dwellers and the architectural heritage. Her present research explores the designation and preservation of industrial heritage through Itatinga Hydropower Station case study. Her research interests include heritage preservation, industrial heritage, identity and the relations between memory and the city. Professor Bloch is an urban and regional planner with professional experience in Africa, Asia and the Middle East. He specialises in urban, metropolitan and regional planning; local and regional economic development; and environmental management. His work has included the entire project cycle, from project identification and formulation through implementation, quality assurance, and monitoring and evaluation of individual projects and programmes. Rosalie’s research looks to the role and influence of transportation systems in the construction of urban spaces. Using Mexico City as a case of study, the research explores the types of mobility that have been produced in this specific urban process. Drawing attention to the different neoliberal policies applied to the current transportation system, observing what kind of projects are promoted in the mobility of the city and who are the main actors and activities behind this urban construction. Jakob's research is tied to a participatory democratic project within the Municipality of Helsingborg, southern Sweden. His specific focus revolves around civic identities. In studying different activities organized by the municipality, the focus is on how people construct themselves and others as citizens through language. Which identities become more relevant than others, in what way and why? Preliminary findings suggest that an emphasis on the future, active and unselfish engagement makes participation relevant, especially if you are a middle-aged parent with a strong sense of local identity. Jakob was at York University for the Fall semester of 2007. Prof. Whitehead's research and teaching focuses on environmental and political geography with a particular concern with the emergence of green and sustainable cities. Prof. Whitehead is a committee member of the Royal Geographical Society's Political Geography Research Group and is on the editorial board of the journal of Social and Cultural Geography. Prof. Whitehead was at York University in September 2007.